As civilians increasingly are targeted in armed conflict, more peace operations have been mandated to protect civilians from physical violence, including sexual violence. Peacekeeping forces around the world have struggled to meet these responsibilities. 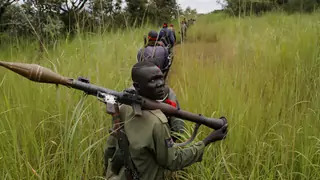 In one recent example, peacekeepers in South Sudan failed to respond when civilians in a refugee camp were subjected to gross human rights violations and aid workers at a hotel compound were raped. The independent special investigation led by Cammaert found that the peace operation failed to “respond effectively to the violence due to an overall lack of leadership, preparedness, and integration among the various components of the mission.” Drawing on lessons from South Sudan and beyond, Cammaert and Mahmoud will reflect on what’s needed to ensure that peace operations around the world are better able to protect civilians from violence. Welcome to “Women Around the World: This Week,” a series that highlights noteworthy news related to women and U.S. foreign policy. This post, covering November 26 to December 12, was compiled with support from Becky Allen and Anne Connell.